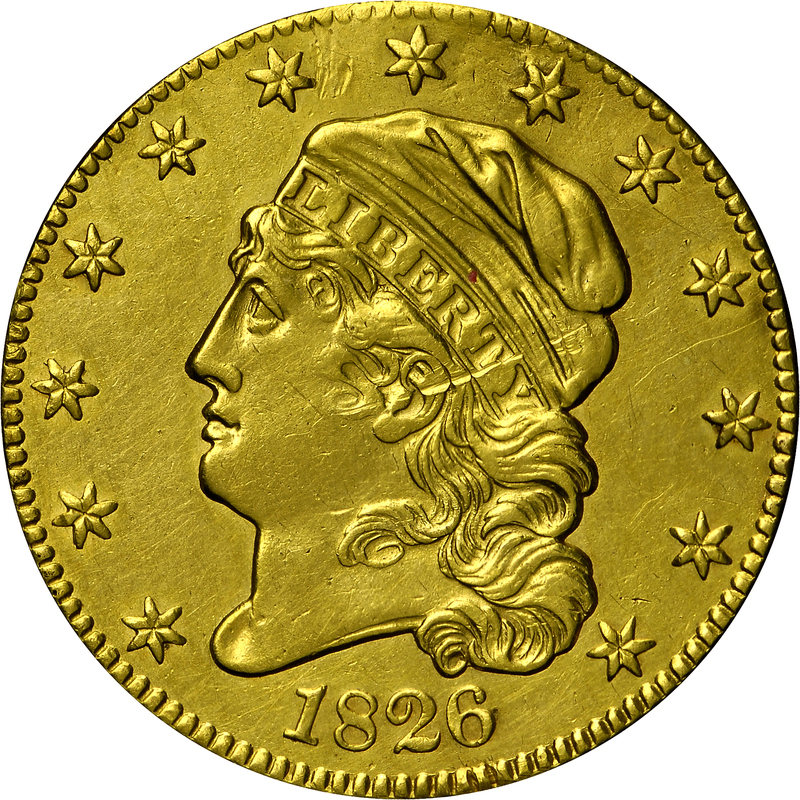 This 1826 half eagle provides a dilemma. 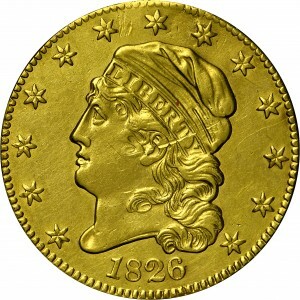 In his 1966 monograph, Walter Breen mentioned the existence of a second variety from obverse 2 and an unknown reverse. 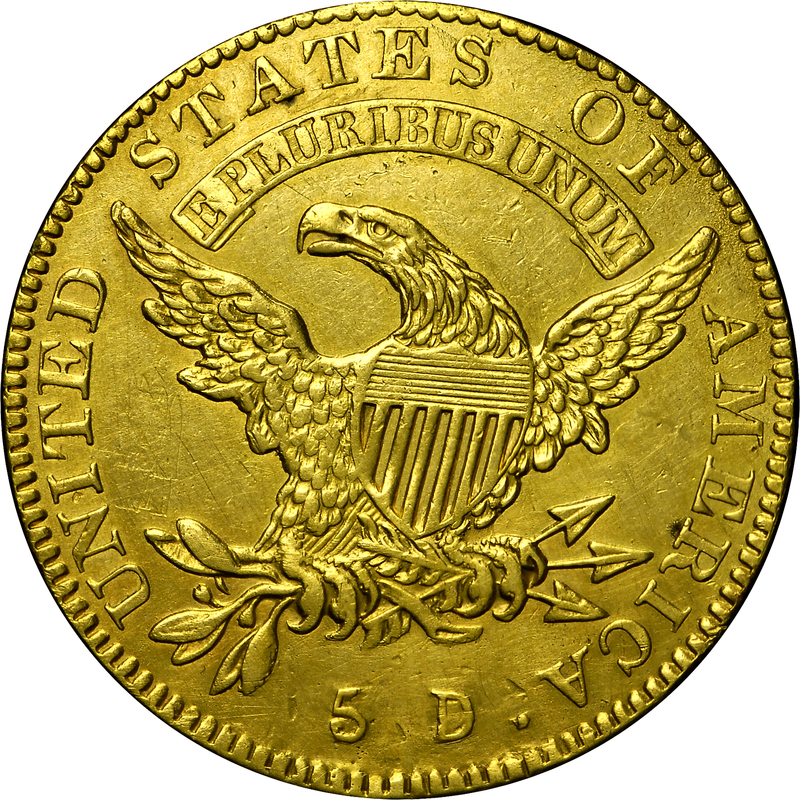 He noted: “This was Jenks 5768, not seen and not traced before or since; described from the Jenks plate.” A plated copy of Henry Chapman’s John Story Jenks catalogue reveals lot 5768 is actually an 1825 half eagle and the only 1826 half eagle, lot 5769, was described as in Mint-State and appears to be the first variety. 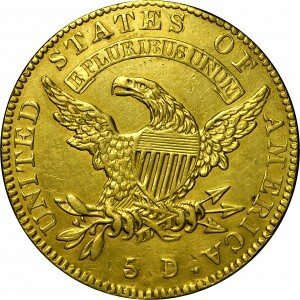 This example has been plugged and re-engraved, however, and clearly appears to be a second variety. From Stack's sale of the Forrest Collection, September 1972, Lot 212. "Obverse: Belted 8. Top of 1 even with that of 8. Star 2 recut. 13th star to right side of curls, distant from 6 (distinctive). Top of 1 even with 8. Reverse: Small letters. Perfect T (no triangular punch in bottom of upright). S over E. T over R and space right. S over U and space right. Base of E minutely high to that of adjacent T. Perfect M. Fairly wide 5 D, 5 distant from leaf, top of 5 markedly higher than that of D. Very small irregular oblate period. One known!